As for the pattern sheet, a lamina of about 0.5mm in thickness that is vinyl chloride or plastic is good. because it cuts easily with scissors and the cutter. 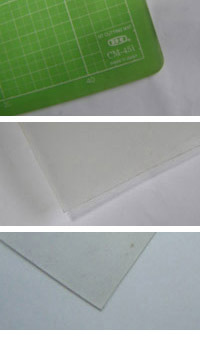 As for casting board, an acrylic board or the vinyl chloride board of about 0.5mm in thickness might be good. Width is made in zonal of length in which surroundings of the clay prototype can be rolled once or more by the height plus about 10cm of the made gypsum mold. One with a sharp tip of the blade is easy to cut the curve. It is possible to cut it by carving the acrylic fiber. The blade of X-ACTO is processed with the grinder and used. a correct rule is necessary. The section is 10mm×30mm in the size and length is free. Because the type board must not shift, it might be good that the Tucker stop is the best and otherwise stops it with a small nail. Tucker's needle is 10mm in width, and the length of the foot is 7mm. The photograph is rapid R23, made in Sweden. It is enough also in a usual saw though the jigsaw board is convenient to cut wood in the curve. 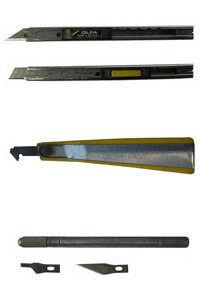 If the blade of Chack saw is folded and used, the stainless steel can be cut. 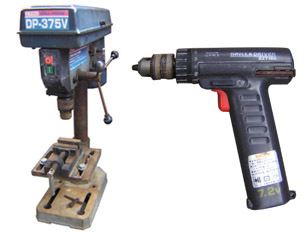 The bench drilling machine is the best for making a vertical hole. 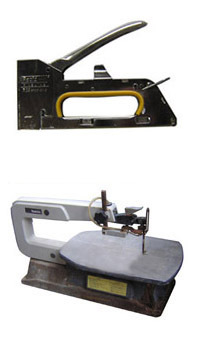 If the stock vice is used, it is safe. However, the center doesn't reach when the hole is made for the center of the disk. The hand drill is necessary. For diameter 6.0mm ironworker. The one like 6.1to6.3mm is used if necessary. 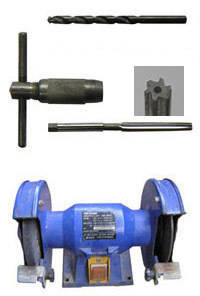 The reamer is diameter 6.1to6.3mm level. A straight, accurate hole is made. Tool that grinds drill and blade, etc. Gypsum must use the specified one. It is necessary to measure the amount of gypsum and water accurately to make steady gypsum. Because a digital kitchen scale can set the weight of the container to 0, it is convenient. 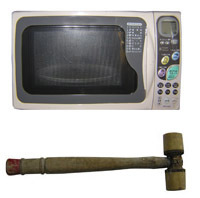 Shrinkage becomes early if warmed for about 20 seconds with microwave oven (500W). When the impact is added to the type, it becomes easy to come off. 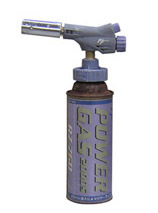 It is possible to heat it also with the gas burner. Do not heat it too much. 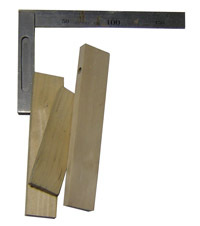 The diameter of a hole and a round stick is measured with calipers that can be measured in 0.1mm. A is placed, and the numerical value is read by B. It is about 6mm. Read the lower scale looking for the upper and lower line agreement by C part. Because it is 0 here, it is 6.0mm. If it is 8, it is 5.8mm. If it is1, it becomes 6.1mm. Production of gypsum mold the past with gypsum potter's wheel. Gypsum is pasted and has placed to the wheel. The entire size is produced to improve accuracy measuring it many times because there is no center axis. The stick of support is held by the armpit, and gypsum is plane little by little. From start to re-doing if it cuts down too much.It was intuition and skilled necessary, difficult work. FP WHEEL is still a technology on the way for development. The one to which the wall of the container was vertical was not able to be construction with the current machine potter's wheel. In FP WHEEL, because the throwing tool is made a movability type, it becomes possible. Figure is a type to which throwing tool does the slide. The critical point has been decided when the throwing tools is swung and it is easy. Use movability type throwing tool and a pair gypsum mold to make the container in the midair. 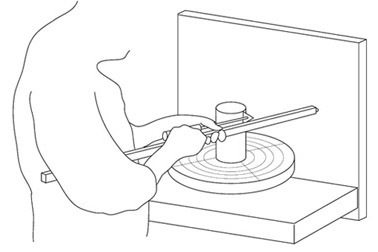 It is a method of making a center axis short and putting the throwing tool. The one like the screw is sure to cut because a center axis is fixed to the wheel.